The Kindle edition of SOLOMON’S COMPASS is on sale from now, April 15, through midnight, April 21, for 99 cents. Don’t miss out on getting your copy for this low price. SOLOMON’S COMPASS is a Coastal Connection novel set along the Texas Coastal Bend in a town called Rock Harbor. This fictional town is based on the real-life town of Rockport, Texas. I ended up changing so much that I thought it would be better to change the name, too. Those of you familiar with Rockport prior to Hurricane Harvey may recognize bits and pieces here and there. Click on the image below to go straight to Amazon! Finding your true north isn’t always easy. It’s more difficult when you’re the target of a killer. Even if you’re the captain of a Coast Guard cutter and the man who makes you crazy is a veteran Navy SEAL. Especially then. But Coast Guard Commander Taylor Campbell is a determined woman… maybe even more determined than Jake Solomon, USN Retired. Gracie is back in the conclusion to The Amazing Gracie Trilogy – Don’t Mess with Gracie. The new-release price of 99 cents will be good through March 18, after which the Kindle edition of the book will go to the regular price of $3.99. Now’s a great time to take advantage of this low price. The book is currently available in Kindle and paperback editions. It will become available in Kindle Unlimited on March 19. 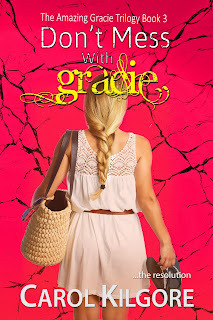 Now let’s get on with Gracie’s launch party! This month, Gracie is on tour. The lovely ladies at Goddess Fish are introducing her to new readers around the web. I hope you’ll join her. In addition to the launch of Don’t Mess with Gracie, I’m also hosting a Goodreads Kindle Giveaway of Jalapeno Cupcake Wench. Enter here to win one of 100 Kindle copies of the first book in the Amazing Gracie Trilogy. Giveaway ends March 19, 2019. It may still be winter, but there’s a sale this week on a “Hot and Spicy Taste of Murder, and Beyond” over at Amazon. 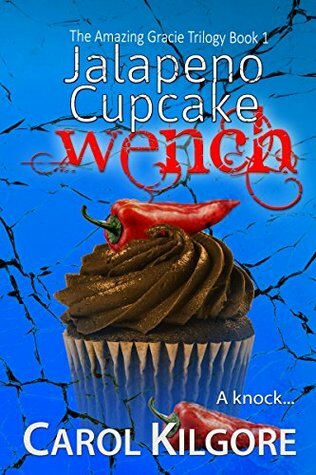 That’s right… this week, the Kindle edition of Jalapeno Cupcake Wench can be had for only 99 cents. Hurry – sale ends midnight Sunday, February 17.
atch for a delivery. In addition to the intoxicating aromas of sugar and chocolate, she also has to fight her own attraction to the man working beside her, Donovan Beck. He’s a hunk and a half and perfect for a spring fling. I love brand new years! So full of promise. This year will be busy around here–new releases, sales, and more. I’ll be writing, but I’m seeing to it that there’s plenty for y’all to do while I’m pulling out my hair or laughing or falling in love all over again. The holiday season is in full swing. At our home, we’re firmly in the middle of all the Christmas preparations. Shopping is done, paper and ribbon are strewn across a long table, and the cards are finally in the mail. No baking this year, but I foresee cookies next December! Wishing you and your family a safe and happy holiday season and a bountiful 2019. Enjoy the fall colors, sweaters, carving pumpkins, and all the Halloween fun. And pumpkin spice everything. In San Antonio, it’s still summer, and I’m hard at work putting the finishing touches on the third book in The Amazing Gracie Trilogy. Gracie and all her friends and family all say hi. Gracie is on sale for 99 cents the last week of September and the first week of October. September: Jalapeno Cupcake Wench. October: Bluebonnet Ballerina. This is your opportunity to purchase both of these Kindle editions for less than the regular price of one. UPDATE JULY 31: There was a problem with the link to T’s Stuff – one of today’s blog stops. I’ve just put in the correct one, so you’re good to go. Over the next three weeks, she’ll be visiting a couple of book bloggers each day. The blogs and links are below. Some of the links will take you directly to that blog’s home page. Others land at various spots on the blog. If you find one of those, just click on the blog name to get to the home page. I’ll be at each stop to respond to comments. At each stop on the tour, you can enter to win one $50 Amazon gift card to be given away when the tour is complete. There are multiple ways to enter, and you can enter at every stop. Many thanks to Goddess Fish Promotions for setting up this three-week book blog tour. Did you drool as Gracie ate her first dark chocolate jalapeno cupcake with creamy dark chocolate frosting? Now you can have the recipe! All you have to do is join my newsletter. Current members received the recipe in a recent mailing.